The Bighorn Sheep viewing site is a highway pull-out with informational signs about Bighorn Sheep. It is located along a field where sheep are frequently seen. Here is a unique opportunity to see Bighorn Sheep in their native environment. It ain't football these rams are playing in the fall, but their headgear is as good as any helmet worn in the NFL. It's Bighorn Sheep mating season in Montana and these big boys mean business. Weighing up to 300 pounds, they charge their rivals at 20 miles per hour, butting heads in a struggle for herd dominance. This violent sport can be heard miles away as their distinctive curved horns collide. One of the best places to watch the big game is the Koo-Koo-Sint Bighorn Sheep Viewing Area just outside of Thompson Falls, Montana. It is part of the Lolo National Fortest, and the area has interpretive signs that describe the natural history of the bighorn sheep, their habitat, and the geology of the valley. 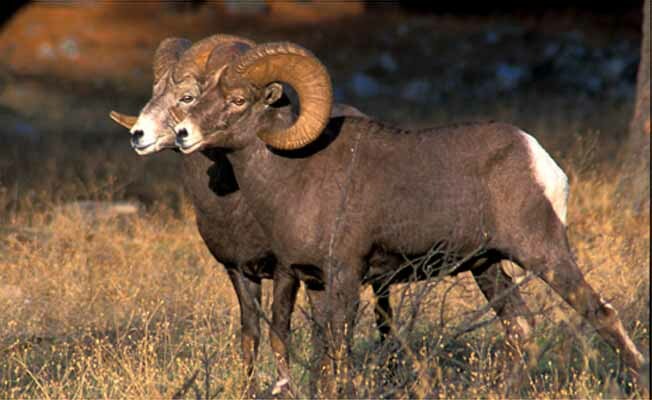 Bighorn Sheep used to be found throughout the West from Canada to Mexico, but today they can only be seen in a few areas. That is what makes Koo-Koo-Sint so remarkable. 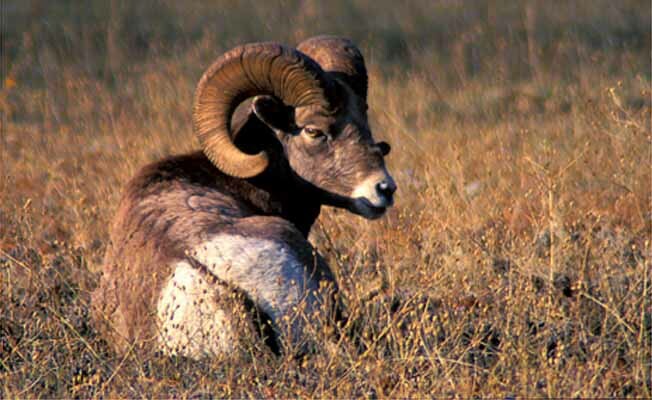 During the peak viewing months of October through December anywhere from seventy to one hundred bighorn sheep may be grazing in the mountain meadow just off Highway 200. The Bighorn Sheep, related the Old World Ibex, are exceptionally social. Or at least the females are. After spending the summer together in high, craggy cliffs, they travel down the mountain as winter approaches to forage for grasses and leaves. The rams, which have been off on their own since the spring, join up with the ewes in this high mountain meadow just as they go into their rut. And that, shall we say, is when the game begins. 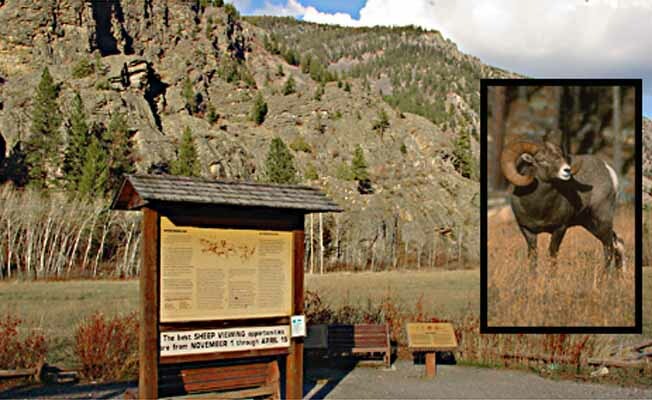 The Big Horn Sheep viewing site is located approximately 6 miles east of Thompson Falls on Highway 200.